Constantius I (Latin: Marcus Flavius Valerius Constantius Herculius Augustus; 31 March c. 250 – 25 July 306) was Roman Emperor from 293 to 306, commonly known as Constantius Chlorus (Greek: Κωνστάντιος Χλωρός, Kōnstantios Khlōrós, literally "Constantius the Pale"). He was the father of Constantine the Great and founder of the Constantinian dynasty. As Caesar, he defeated the usurper Allectus in Britain and campaigned extensively along the Rhine frontier, defeating the Alamanni and Franks. Upon becoming Augustus in 305, Constantius launched a successful punitive campaign against the Picts beyond the Antonine Wall. However, Constantius died suddenly in Eboracum (York) the following year. His death sparked the collapse of the tetrarchic system of government inaugurated by the Emperor Diocletian. Born in Dardania, Constantius was the son of Eutropius, whom the Historia Augusta claimed to be a nobleman from northern Dardania, in the province of Moesia Superior, and Claudia, a niece of the emperors Claudius II and Quintillus Modern historians suspect this maternal connection to be a genealogical fabrication created by his son Constantine I, and that his family were of humble origins. Constantius was a member of the Protectores Augusti Nostri under the emperor Aurelian and fought in the east against the secessionist Palmyrene Empire. While the claim that he had been made a dux under the emperor Probus is probably a fabrication, he certainly attained the rank of tribunus within the army, and during the reign of Carus he was raised to the position of Praeses, or governor, of the province of Dalmatia. It has been conjectured that he switched allegiances to support the claims of the future emperor Diocletian just before Diocletian defeated Carinus, the son of Carus, at the Battle of the Margus in July 285. In 286, Diocletian elevated a military colleague, Maximian, to the throne as co-emperor of the western provinces, while Diocletian took over the eastern provinces, beginning the process that would eventually see the division of the Roman Empire into two halves, a Western and an Eastern portion. By 288, his period as governor now over, Constantius had been made Praetorian Prefect in the west under Maximian. Throughout 287 and into 288, Constantius, under the command of Maximian, was involved in a war against the Alamanni, carrying out attacks on the territory of the barbarian tribes across the Rhine and Danube rivers. 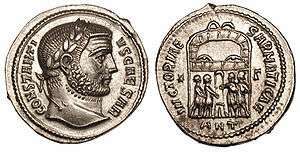 To strengthen the ties between the emperor and his powerful military servant, in 289 Constantius divorced his wife (or concubine) Helena, and married the emperor Maximian’s daughter, Theodora. By 293, Diocletian, conscious of the ambitions of his co-emperor for his new son-in-law, allowed Maximian to promote Constantius in a new power sharing arrangement known as the Tetrarchy. Diocletian divided the administration of the Roman Empire into two halves, a Western and an Eastern portion. Each would be ruled by an Augustus, supported by a Caesar. Both Caesars had the right of succession once the ruling Augustus died. At Milan on March 1, 293, Constantius was formally appointed as Maximian’s Caesar. He adopted the names Flavius Valerius and was given command of Gaul, Britannia and possibly Hispania. Diocletian, the eastern Augustus, in order to keep the balance of power in the imperium elevated Galerius as his Caesar, possibly on May 21, 293 at Philippopolis. Constantius was the more senior of the two Caesars, and on official documents he always took precedence, being mentioned before Galerius. Constantius’ capital was to be located at Augusta Treverorum. Constantius’ first task on becoming Caesar was to deal with the Roman usurper Carausius who had declared himself emperor in Britannia and northern Gaul in 286. In late 293, Constantius defeated the forces of Carausius in Gaul, capturing Bononia. This precipitated the assassination of Carausius by his rationalis Allectus, who assumed command of the British provinces until his death in 296. Constantius spent the next two years neutralising the threat of the Franks who were the allies of Allectus, as northern Gaul remained under the control of the British usurper until at least 295. He also battled against the Alamanni, achieving some victories at the mouth of the Rhine in 295. Administrative concerns meant he made at least one trip to Italy during this time as well. Only when he felt ready (and only when Maximian finally came to relieve him at the Rhine frontier) did he assemble two invasion fleets with the intent of crossing the English Channel. The first was entrusted to Asclepiodotus, Constantius’ long-serving Praetorian prefect, who sailed from the mouth of the Seine, while the other, under the command of Constantius himself, was launched from his base at Bononia. The fleet under Asclepiodotus landed near the Isle of Wight, and his army encountered the forces of Allectus, resulting in the defeat and death of the usurper. Constantius in the meantime occupied London, saving the city from an attack by Frankish mercenaries who were now roaming the province without a paymaster. Constantius massacred all of them. Constantius remained in Britannia for a few months, replaced most of Allectus’ officers, and the British provinces were probably at this time subdivided along the lines of Diocletian’s other administrative reforms of the Empire. The result was the division of Upper Britannia into Maxima Caesariensis and Britannia Prima, while Flavia Caesariensis and Britannia Secunda were carved out of Lower Britannia. He also restored Hadrian’s Wall and its forts. Later in 298, Constantius fought in the Battle of Lingones (Langres) against the Alamanni. He was shut up in the city, but was relieved by his army after six hours and defeated the enemy. He defeated them again at Vindonissa (Windisch, Switzerland), thereby strengthening the defenses of the Rhine frontier. In 300, he fought against the Franks on the Rhine frontier, and as part of his overall strategy to buttress the frontier, Constantius settled the Franks in the deserted parts of Gaul to repopulate the devastated areas. Nevertheless, over the next three years the Rhine frontier continued to occupy Constantius’ attention. In 303, Constantius was confronted with the imperial edicts instituted by Diocletian dealing with the persecution of Christians. The campaign was avidly pursued by Galerius, who noticed that Constantius was well-disposed towards the Christians, and who saw it as a method of advancing his career prospects with the aging Diocletian. Of the four Tetrarchs, Constantius made the least effort to implement the decrees in the western provinces that were under his direct authority, limiting himself to knocking down a handful of churches. Between 303 and 305, Galerius began maneuvering to ensure that he would be in a position to take power from Constantius after the passing of Diocletian. In 304, Maximian met with Galerius, probably to discuss the succession issue and Constantius either was not invited or could not make it due to the situation on the Rhine. Although prior to 303 there appeared to be tacit agreement between the Tetrarchs that Constantius’s son, Constantine and Maximian’s son Maxentius were to be promoted to the rank of Caesar once Diocletian and Maximian had resigned the purple, by the end of 304 Galerius had convinced Diocletian (who in turn convinced Maximian) to appoint Galerius’s nominees Severus and Maximinus Daia as Caesars. Diocletian and Maximian stepped down as co-emperors on May 1, 305, possibly due to Diocletian's poor health. Before the assembled armies at Milan, Maximian removed his purple cloak and handed it to Severus, the new Caesar, and proclaimed Constantius as Augustus. The same scene played out at Nicomedia under the authority of Diocletian. Constantius, notionally the senior emperor, ruled the western provinces, while Galerius took the eastern provinces. Constantine, disappointed in his hopes to become a Caesar, fled the court of Galerius after Constantius had asked Galerius to release his son as Constantius was ill. Constantine joined his father's court at the coast of Gaul, just as he was preparing to campaign in Britain. In 305 Constantius crossed over into Britain, travelled to the far north of the island and launched a military expedition against the Picts, claiming a victory against them and the title Britannicus Maximus II by 7 January 306. After retiring to Eboracum (York) for the winter, Constantius had planned to continue the campaign, but on 25 July 306, he died. As he was dying, Constantius recommended his son to the army as his successor; consequently Constantine was declared emperor by the legions at York. Constantius was either married to, or was in concubinage with, Helena, who was probably from Nicomedia in Asia Minor. They had one son: Constantine. As the father of Constantine, a number of Christian legends have grown up around Constantius. Eusebius's Life of Constantine claims that Constantius was himself a Christian, although he pretended to be a pagan, and while Caesar under Diocletian, took no part in the Emperor's persecutions. His first wife, Helena, claimed to find the True Cross. Constantius's activities in Britain were remembered in medieval Welsh legend, which frequently confused his family with that of Magnus Maximus, who also was said to have wed a Saint Elen and sired a son named Constantine while in Britain. Henry of Huntingdon's History of the English identified Constantius's wife Helen as British and Geoffrey of Monmouth repeated the claim in his 1136 History of the Kings of Britain. Geoffrey related that Constantius was sent to Britain by the Senate after Asclepiodotus (here a British king) was overthrown by Coel of Colchester. Coel submitted to Constantius and agreed to pay tribute to Rome, but died only eight days later. Constantius married his daughter Helena and became king of Britain. He and Helena had a son, Constantine, who succeeded to the throne of Britain when his father died at York eleven years later. These accounts have no historical validity: Constantius had divorced Helena before he went to Britain. Similarly, the History of the Britons traditionally ascribed to Nennius mentions the inscribed tomb of "Constantius the Emperor" was still present in the 9th century in Segontium (near present-day Caernarfon, Wales). Ford credited the monument to Constantine, the supposed son of Magnus Maximus and Elen, who was said to have ruled over the area prior to the Irish invasions. ↑ "Marcus Flavius Valerius Constantius", "Valerius Constantius", "Gaius Valerius Constantius", and "Gaius Fabius Constantius" have been found on inscriptions, while Aurelius Victor (Caes 39:24) implied it may have been "Julius Constantius"
↑ Tooke, William (1798). A new and general biographical dictionary. G. G. and J. Robinson. p. 69. Constantius, who from his pale complexion had acquired the denomination of Chlorus . ↑ Nennius (attrib.). Theodor Mommsen (ed.). Historia Brittonum. Composed after AD 830. (Latin) Hosted at Latin Wikisource.